BRAND NEW! TWO WRENCH TOOLS, ONE 7" & ONE 9 1/2", ONE CRIMPING TOOL, 100 of 0.0312" x 0.085" CLEAR PICTURE FRAME BUMPERS AND ADDITIONAL HANGING KIT PARTS FREE WITH YOUR ORDER ALONG WITH FREE FRAMING HARDWARE SAMPLES!!! BRAND NEW! 30 OF THE INDIVIDUAL PACK 17-PIECE SECURITY HANGING KIT FOR WOOD FRAMES PACKED WITH INDIVIDUAL INSTALLATION GUIDE! SHIP FROM VA BY USPS PRIORITY MAIL WITH CONFIRMATION!!! FREE FRAMING HARDWARE SAMPLES WITH EVERY ORDER!!! VALUE PACK!BRAND NEW! 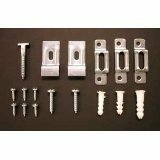 30 OF INDIVIDUAL PACK 17-PIECE SECURITY HANGING KIT FOR WOOD FRAMES PACKED WITH INDIVIDUAL INSTALLATION GUIDE! 17-PIECE ANTI-THEFT SECURITY HANGING KITS FOR WOOD FRAMES! TWO WRENCH TOOLS, 7" & 9 1/2" WRENCH ONE EACH, ONE CRIMPING TOOL TO MAKE OR ADJUST PICTURE CABLES & 100 OF 0.312" x 0.085" CLEAR PICTURE FRAME BUMPERS AND EXTRA KIT PARTS FREE WITH YOUR ORDER ALONG WITH FREE FRAMING HRADWARE SAMPLES!!! IN BUSINEES SICE 1993! THANK YOU IN ADVANCE FOR GIVING US THE OPPORTUNITY TO SERVE YOU!!! SPECIAL VALUE COMBO KIT! ON SALE FOR A LIMITED TIME! BUY & SAVE!